Osmosis: Vibrio cholerae (cholera). (2019, April 20). 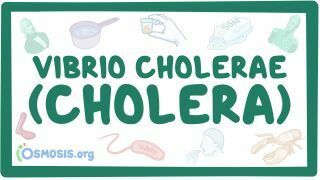 Retrieved from (https://www.osmosis.org/learn/Vibrio_cholerae_(cholera)). Vibrio cholerae is a gram-negative, comma-shaped bacterium. The bacterium's natural habitat is brackish or saltwater. Some strains of V. cholerae cause the disease cholera. V. cholerae is a facultative anaerobe and has a flagellum at one cell pole as well as pili. V. cholerae can undergo respiratory and fermentative metabolism. When ingested, V. cholerae can cause diarrhea and vomiting in a host within several hours to 2-3 days after ingestion. Giving and high volume oral fluids is the most effective treatment for cholera. A 34-year-old Caucasian man is brought to the emergency department by his girlfriend after losing consciousness. Medical history is relevant to recent travel to South America. Upon medical interrogation, the girlfriend claims that he started feeling sick a couple of hours after eating ceviche. He started with frequent episodes of voluminous and watery diarrhea. Physical exam shows dry mouth and swollen tongue, sunken eyes, and shriveled and dry skin. His temperature is 36.5°C (97.6°F), pulse is 70/min, respirations are 16/min, blood pressure is 120/80 mmHg. A stool culture is obtained, and the bacteria is growing in a thiosulfate-citrate-bile salts-sucrose agar. Which of the following is a characteristic of the microorganism responsible for this patient's symptoms?